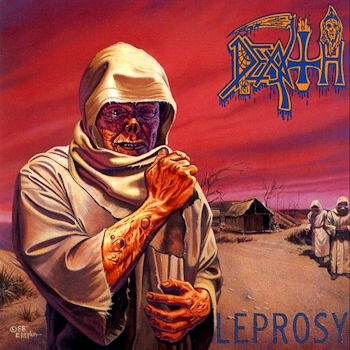 Time and repeated listens to the Death discography have altered my feelings and perception – I view “The Sound of Perseverance” as a functional but mediocre epitaph of this band with a few highlights – the real meat of Death lies in their earlier offerings – nowhere better encapsulated and expressed than on “Leprosy”. The Florida death metal band offer simple chromatic metal riffing – non cyclic song structure – brilliant lead guitar work which is equal parts atonal and neo classical in portions – functional drumming with entertaining sequences of blast beats back when they were used sparingly and at the correct time – and a healthy obsession for exposing the grim realities of life like, you guessed it – incurable diseases – disgusting deformities of the human body – euthanasia – and open caskets, things that mainstream would rather people forget and buy the latest party album only for $15.99. The bass is lucid, clearly audible and compelling – check “Born Dead”. Music is a window to how we perceive life – the view here is not a nice or comforting one – but a harsh, supremely beautiful one. Simple, effective, compelling, influential, enjoyable, cathartic death metal from one of the early first wave American Death Metal bands. Enjoy. Recommended Tracks – Leprosy, Open Casket, Pull the Plug, Left to Die. Tags: 1988, Baba T, Death, Death Metal, Euthanasia, Leprosy, METAL, Music, Music Reviews, Pull the Plug. Bookmark the permalink.